Re: What did you do in your shop today. Finally got around to shooting another coat of primer, during which I knocked over my gun while filling, that took a long time to clean up. Then assembled to ensure things still fit, now back to sanding. Well, a couple of weeks ago, I was looking through the AeroFred collection of plans and came across something called the Mini Bunt, a 1/2A combat plane . I had never heard of it but after doing a bit of digging, I found some interesting information and that "tweaked" my interest . So, I downloaded a set of plans, made the templates and cut out two of them. 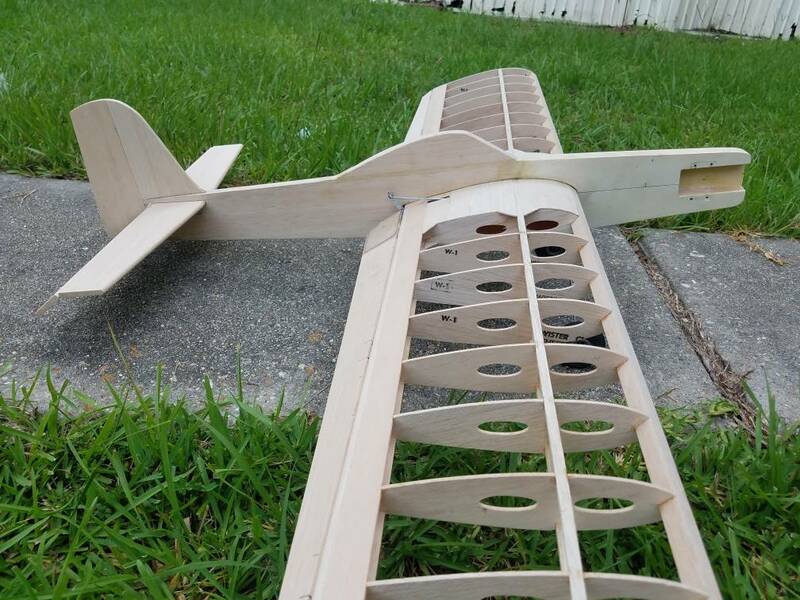 The first one I built, I ended up giving to one of my club members to see how he would finish it while I built the second one . 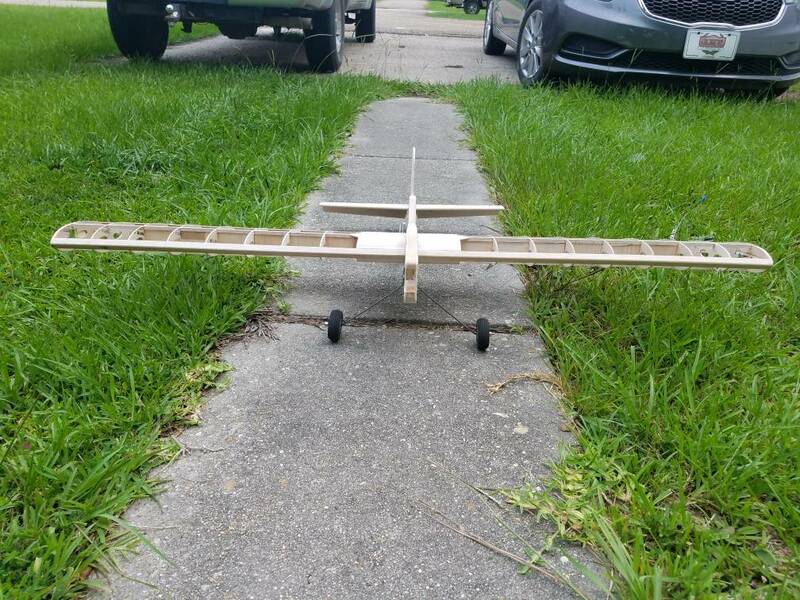 I finished it and managed to get the initial test flight this past Saturday. I considered that test flight a failure as the bellcrank mount failed shortly after takeoff . No matter, the repairs are now complete and the Mini Bunt is ready for a true test flight! 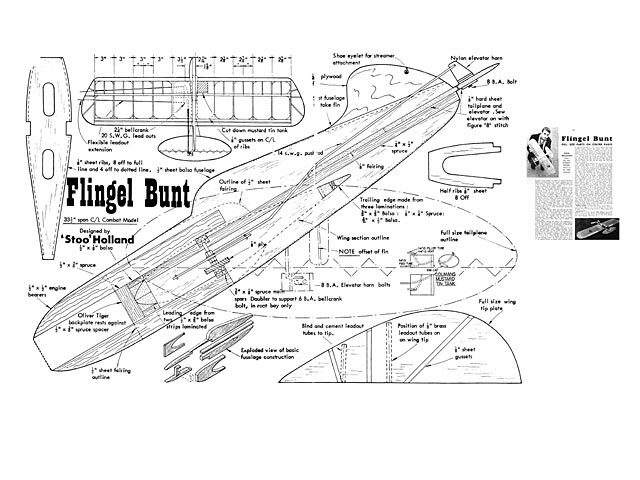 The Original Stoo Holland Flingle Bunt was a free centerpge reduced dimensioned with side view & tailplane F size . Bout the first thing I had that would drag itself off the groubd . Tho hand launched . PAW 19 DS . Lasted 5 minutes . Well I'll be doggoned!! I had no idea!! Thanks! Who knows, I just might try building one of these if I can blow the plan up a bit!! Special Propellor for ST 4500 for Combat . 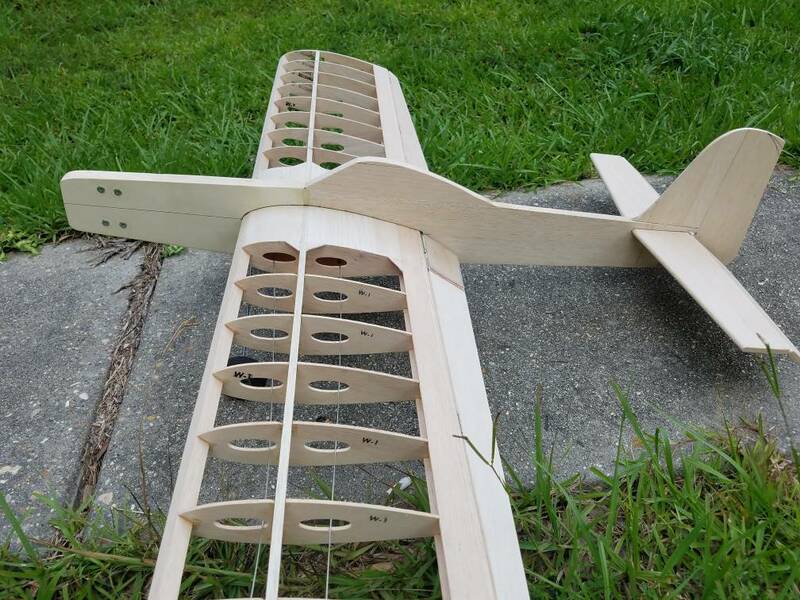 Vert Stab and aft underblock on the most reasearched developed good flying scaley Spitfire F2B in the Known Universe . just a short video finally of teh SAKITUMI 60+ flying. working on motor setting and tank placement before doing anything much for actual trimming. Today i had a work doing CNC foam cutter. Threw the Magnum/genisis/ p-51 rwork in thew Air, with the ROYAL 46 , of the previous pitchers . Seems promising , leaned off later, but wont blame it for that , no cowl but no crankcase cooling duct . Should whack a hole in the Top ? . 12 x 5 old nylon top flite ., .312 Venturie . Distinct 4-2 reasonably consistant. Maybe try it without the spinner , to get some air through up there , tomorrow . no Shortage of grunt , a bit of breeze didnt bother it . Atrocious Scedsule , but full . Havnt flown for a bit , and only thawed out today , ALMOST . Blew some peliminary dupli colour ( big Can ) silver on the wings of the Spitfire . Wednesday . which'l flow it on the TOP without running down the sides of the rib , unless your gung ho . Went through my miscellaneous engine boxes, making sure they were all loose. Disassembled and cleaned a Larry Foster Fox 35 that was hopelessly gummed up (put up and not cleaned properly since last run in 1994), installed a conventional needle, found all the Fox parts/mufflers, put them in the same box wrapped in shop rags. 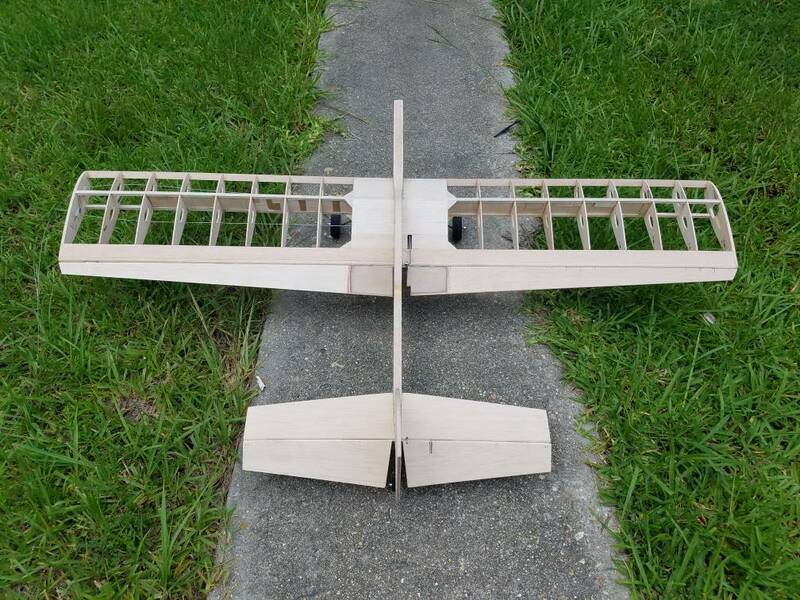 This is for a project I am slowly working towards, having lost some interest in finishing my real airplanes (two of which are sitting with all components constructed but awaiting assembly). Did similar with my .049s, up to about 15 of them of various types. Am missing a Medallion .049 somewhere, I have two but only found one, so tomorrow I will dig through other likely spots and find it. Then go through the "good" engines and make sure I know where all the parts are and they are not gummed up. day they were stored. All the ones with Marvel or Sta-Lube Air Tool oil were various stages of gummy. Adapted a K&B muffler to fit a OS 30S engine I have using pieces from a universal tongue muffler. K&B + O.S.= a real BS engine!! Stripped, degummed and cleaned my OS 20 four stroke that was sitting around for 20(?) years. First used it on a Sig Akromaster before putting it away. It was so stuck I had to torch it to free it up. It runs better now than I remember and will replace a 25FP in an RC Gypsy Moth. A 'Moth floating around with a four stroke up front should be way cooler than buzzing around with a two stroke. PS - You'll see a grown man crying when my supply of Dawn Power Dissolver runs out. And IVE put a OS 35 Silentflow Muffler on a K&B 40 stunt . The holes are close enough ( 1 / 8 bolts ) carved a custom stack / adaptor , rather than devalueing a stock OS bit tween silencer toob & Injun . Works good , as does the FOX .25 BB Scneurle muffler body , mount cut off , drilled & port opened . So Smaller ones are light & free breathing , for something like a 40 in a stunter . Captured the bird that was in my shop for several days. He flew off seemingly unharmed. Bought lumber to expand my work bench to accommodate the PT-19 project. Had sufficient width to lay up the wing, or the fuselage, but once joined there was no way it was going to fit. Should be plenty of room when I'm done. Hopefully have it in place tomorrow. Also plan on trying to mow my circle tomorrow. Rolling with my Twister thats long overdue to be finished. Horizontal stab/elevator slotted... getting horn fitted as we speak. Epoxied brass tubing in flaps for flaphorn. Much much more solid and no play in the flaps!!! Jb welded RSM stainless coupler of CF pushrod. Will complete other end once stab n elevator is set and glued. Here we are as of now and still plenty to do til ready to cover n paint. 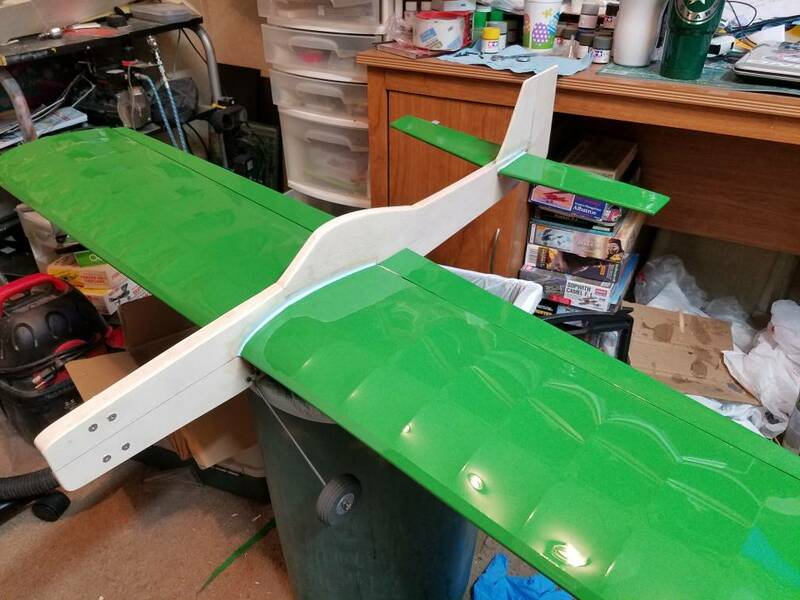 Flaps and elevator arent glued in yet. Horizontal stab just pinned for now. Tip weight box to be installed. Cheek cowl for the inboard side just to hide the blind nuts. Nothing fancy. Need to get some ball links for pushrod. Solder adjustable tank mounts to the fuel tank. Epoxy 4-40 threaded inserts for tank. Going with a RSM GRW 5.25oz Uniflow. Nothing like seeing great workmanship of a model. I like the way you hid your hinges. James, great work. But I'm curious, what is the reason for the design of the spar? Never seen one like that. Thanks yall for the encouraging words. Even more motivating to hear it. The spar is 1/4" spar top n bottom. But with Vertical Sheer webbing between the spars. Severely cuts the wing flex down. 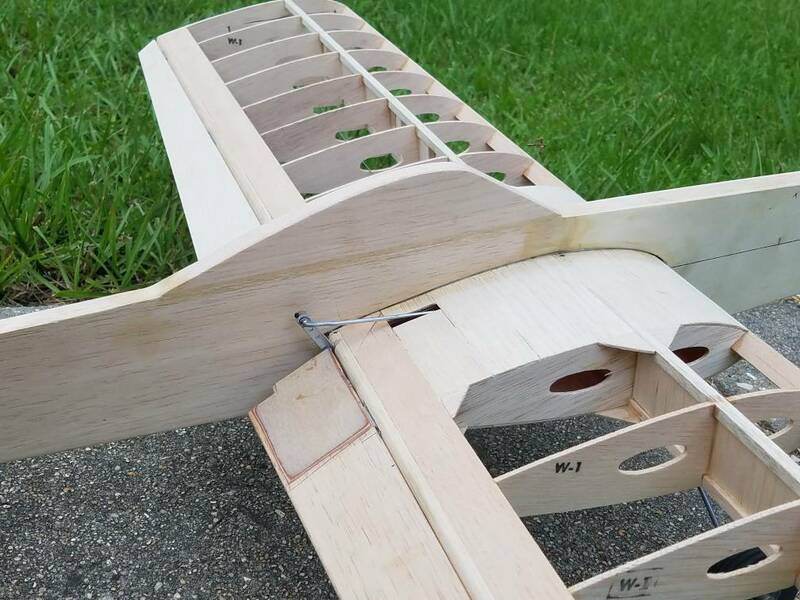 Makes it more stiff and tge fuselage doesnt sag as it would built per plans. Surely you can put the Webbing in the TE and probably achieve same results. 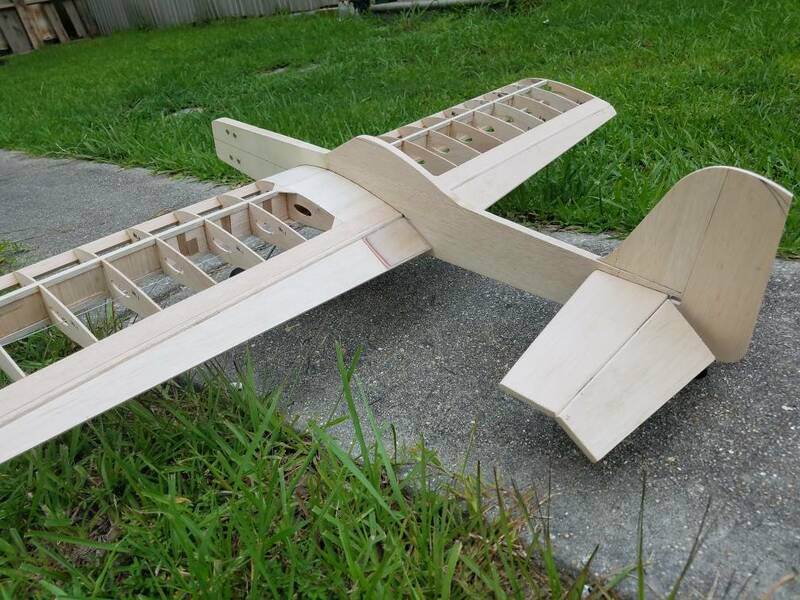 Building this plane in hopes of it taking me from Intermediate to least mid Advanced...in other words my main pattern trainer/ Profile competition bird. Least till I Build a Vector or Legacy or anything better to learn on. My Primary Force is excellent trainer courtesy of Ty Marcucci... but doesnt corner well via Triangle and Hourglass. So i figure this twister will deliver what I need to help me get better since it does have flaps. Altho a Umland Francherized kit is on my to build list. That's the plan atleast lol. If you are to the point you can complain about the corners in the triangle and hourglass you are probably ready for the Vector or Legacy. You might also try a Caviler. It is a great transitional plane. You are going to like the difference in the rounds with flaps. Nah not quite ready... or maybe. The plane flies beautiful squares or atleast handles squares beautifully i should say lol. Corners of triangles n hourglass on this plane orks me and usually is pretty wild as it will waffle if cornered too hard. The plane flies beautiful squares or at least handles squares beautifully i should say lol. Corners of triangles n hourglass on this plane orks me and usually is pretty wild as it will waffle if cornered too hard. The Twister with flaps won't stall if you don't stretch that back leg too much, especially on the hourglass. The reason they call it the hour glass is because you frequently run out of time to make that last turn! Finished my expanded bench. It will have to be fully replaced at some point prior to building a bigger stunt ship, but now I have an area about 3x5.5' that has additional room at one end making it sort of a "T". For my 48" PT-19 it will suffice. Found some time to do a bit of work on Pushy Galore's landing gear. Wire gear on the left is the new, the wire gear on the right is the old. The difference isn't all that noticeable, but the angle and the length has been changed. Rear wheels will be 2.5" and the nose wheel is 2.25". Carved in stone. I continued the process of putting 00 Silkspan over the entire surface of my new DOG. So far I've covered the wings, Flaps, stab, elevators, and all the little hatch covers, as well as the landing gear. Still left is the Fuselage and then all the fillets! Fillets, my least favorite thing to do. Screwed them up on the last build and had to remove them and do them again...used some old filler and it didn't adhere properly and they all curled up. Expensive lesson, I won't do that again! The airplane is 710 sq in., set up for inter-changeable engines; PA75, Pipe, ROJett76, Pipe. and K77 Pipe (Stalker, Minato, Smith). I intend to start with the K77 first but wanted options since it's a bit of an unknown even though it has had a lot of excellent reports on performance. Primer and painting should hopefully begin next week! Would like to have it finished by late August if I can stay healthy. Life gets a little more complicated it seems at age 78. I have big hopes for it. My last Dog kinda turned out to be a "DOG"! The Colossus isn't so Colossus...at least mine isn't. Not terrible but definitely not competitive in PAMPA. I should have had this one finished before this summer but age and other woes got in the way! This one is 50 oz as is with all the goodies mounted so I have great hopes for it coming in around 60oz finished. tho knifed of dregs along tape . Removed tape near / before hard . Had to knife a few tape remanants . The blue 3M tapes bettern masking tape . Maybe Beginners luck , but came out good . round tube knife handles for sand paper along , etc . Before throwing on a few coats of dope . 120 Wt paper . A quick light hit being preferable to laborious hours with polishing paper . Knock the lumps off , dope fill any hollows . Then 320 3M paper . I get Talc from art store . Unadulterated . Babys Bottom talc is disaterous as oiled & scented so wont stick , delaminates and craters . P S , mix / saturate the resin till near saturated / semi chalky . Throw a skim of pre resin ( no filler ) base first , for adhesion . Before M Ballons in . Cool here , so heat gun to soften / thin - spread . To much & itll kick it off . F'Glassed the Spitfire Cowls & Nose . Temp 10 to - Deg. C. , So unhardened for 24 + Hrs. To to much catylist with ruin / brittalise it . Compared to 10 / 15 Min Kick off summer / 30 Deg. c , where your left high & dry with , instant haredened on brush in pot etc etc . A COOL DAY / In Shade . Not 2 pm when its warmest ( Pre 10 , after 5 ) so your unhurried . Cleared Bench , Supports out , Rags Etc Handy . Get it Done. THEN put it In the Sun . something like that, anyway . P S I think much cleaner edges & straighter continuous curve if Fillets AFTER covering . Nearer to much M Ballons to resin that to little . A brushed on coat of resin after sanded will toughen surface if Required . Fitted the hardware and shiny decals to my new Banshee. Maiden flight today . . .
We expect a flight report! Yesterday, during a moment of feeling melancholy, I decided to resume work on a .40 Rat Racer that according to my build log, I started construction back in May of 2012. It was a bit of a dream back then because a while previously, I had signed up for a contest and was told my Quickee Rat was illegal because I had an essentially brand new box stock K&B 40 (4011) on it. I didn't then and still know nothing about modifying engines like the "experts", I just wanted to try. I left and was really frustrated and angered by the narrow mindedness but that again, those were the rules and apparently there was no way of letting a new guy try and either succeed of fail. Well, I returned home where after getting over being pissed, I eventually did fly it. I was pleased. 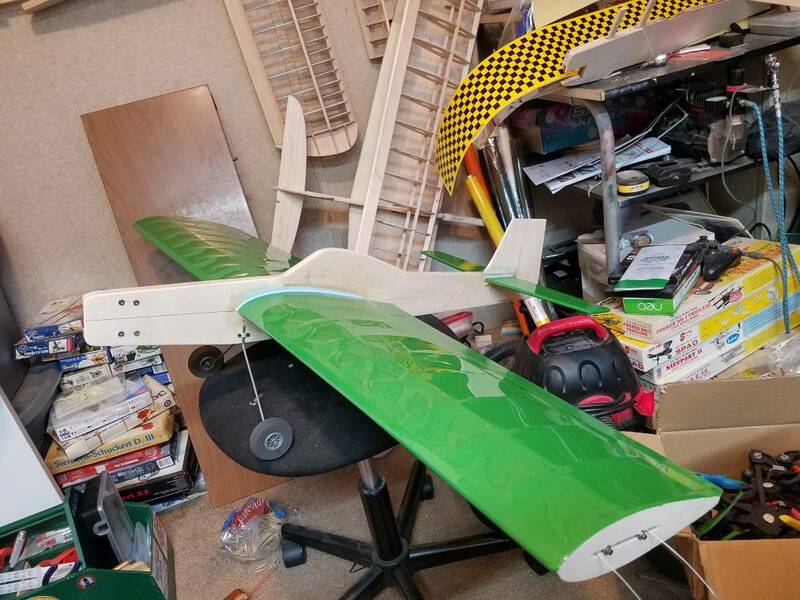 I guess I've flown it, with some friends, probably 10 or 12 times over the years, 2009 to 2011, but I figured I could do something to go faster so I made another but slightly modified Quickee Rat with a slightly longer and wider fuselage so I could mount my Rossi 40 Q-500 engine. 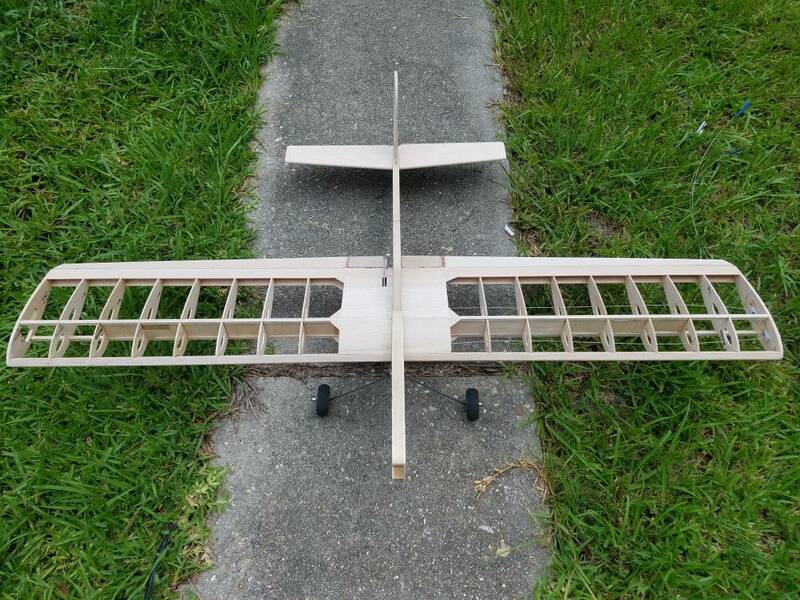 I made the wing from a 18" piece of Sig airfoil shaped balsa laminated on the bottom with a piece of 1/64" plywood. Well, "life" took over and the plane was set on the rack until yesterday. Looking at it now, I'm second guessing that I probably should have made the wing 21" - 24" .... who knows!! Oh well .... maybe it will get done this time!! Turned a hardwood mandrel to seat new bearings in an OS 20 four stroke. I've had some bad luck with heating the case and expecting the bearing to line up and seat properly with a push. Lesson to self "Trying out a new engine on a new plane is a bad idea" Plane flys well but it came out heavy, i had planned on 32oz and it ended up being a heavy weight at 36oz. 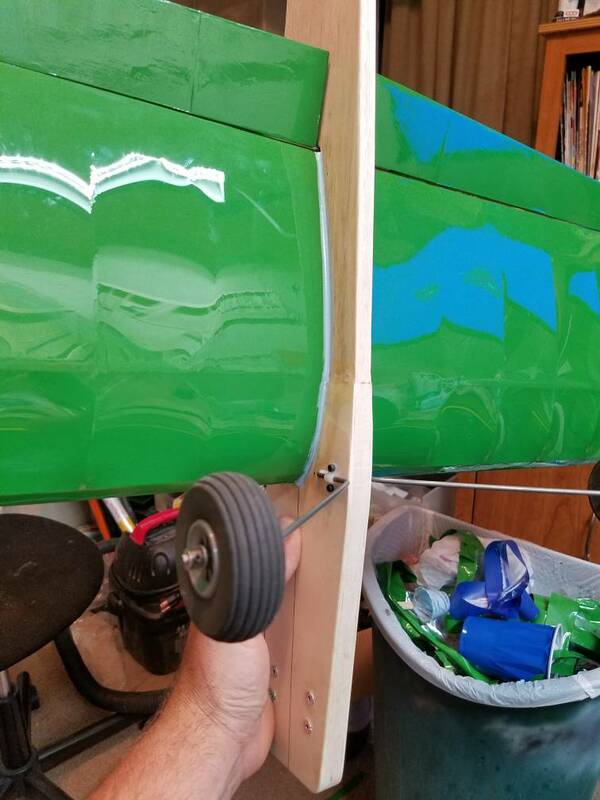 I had a "grown up" help me get alignment right when I glued the wing and tail in and it flew straight without any bad tendencies. I will swap out engines this week for a faithful Custom "Brett Buck Tuned" OS 25. Which will hopefully give me better performance. Layed out the ' currently fasionable ' Invasion Stripes . 69 outboard , 72.5 inboard for assymetric wing . Half Span O/A Cover . 2H pencil initially . Root Base Line needed minimum fanagling . Tape At LE & TE in places so datum true through Top to Bottom . to dial in true . Then the ball point , so the wont fade / sand / dematerialise , after all that effort . alignment . Being dialed in by that stage , a few bits were free hand . A straight lines a lot easier than a circle . Theyre Next . None on the underside . Got some semi metalic paint thats pretty much a match for the Photo recon Blue . So likely thats going on . Last minute changes to scavenging before world champs. Wings and tail surfaces covered. Fillets started tonight. Hoping for paint this weekend!!! Also cut the rudder down... it bugged me too much. At 36oz I think you should have plenty of power with the OS 25. Is it a FP? I continued to cut out new parts for my PT-26. How inexperienced people ever put some of these Sterling kits together I don't know. Radiused fuselage bulkheads, many of them aren't even cut symmetrical!!! On several I had to make my best guess as to which side was "correct " , trace it out on paper, cut one side out and fold it over to tell me how to cut out the other side so they are symmetrical. Also got some components to try my first "soda bottle vacuum form canopy" attempt. Will let you know tomorrow how that goes. Well first attempt at making a plastic canopy using the soda bottle method. I have a Sterling F4U Corsair kit, so I used the canopy as a mould. I filled it with plaster which dried overnight, then I popped the plaster cast out and used it as my plug. Took 2 tries to get to this result. Details are there, but not crisp. I found a local source of proper plastic sheet which I will try to get tomorrow. Going to put together a vacuum table when time allows. Do you think an assembly of 2-3 infared heat lights placed close above the table would be an adequate heat source? It has been years since I pulled a canopy and I used kitchen range for heat. The bottle method worked for me but I used wooden plugs that I carved. This pic of yours looks like it was not packed tight enough or need more heat on the side. I've pulled them and pulled thin ABS stock. You can put a wood frame around the oversized sheet. Place the plug on a stand then heat the sheet over the plug and pull as it gets heated. Takes two people. Three if someone is just watching. Might take a few tries to get it down and a good choice experimenting with material thickness. The bigger the canopy the more difficult. It can be done with good results. I've never pulled a canopy with 'frame' detail this way. Yes, the frame detail does seem to complicate it a little. The one I ultimately need for my PT-26 I might need to add framework details after. Not sure yet. Frame is simple, 4 or 2 pieces of wood. Stapled to the sheet. You can get the look of a frame using just paint. Tape off and spray. No primer buildup on the canopy because you see that color looking in. Did someone mention using part of a Stuka canopy? I know Park Flyer was mentioned. I have two Stuka canopies from them but not the shape you need. I'll pester him for cowling blisters soon. Nice project you're working on BTW. I went flying instead. got about 60 flights on my Shark 45. Starting to learn how to fly her. Shortened lines from 67 to 65' Used a handle with wider line spacing. She's getting better all the time. theres Green italian mineral water & Blue Aldi Mineral water ones o.k. too . saves Dyeing if thats your trip . I use over a gas element , tho the heat gun assisted on the Caudron One , Earlier on here . ( Spits done from coke bottle ) . Many have to many patterns / pips , that maybe dont all dematerialise . I chuck a few sticks , narrow as the base , under the plug . Or a wedge also - maybe a packer between the two sticks so theyre wedged . Curve of the canopy ( Header Rail ) up front where the top curve in starts . ALSO cut the neck just inside the flange - to loose the thick bit . seems the heat dissapation / conductivity , is more even with it gone . then running through to get even temp through the area to be used ( Stress Relief ?? ) if further harrasment wasnt required . GLOVES & Maybe a bucket of water to dump it in may help . Washing or at least wipeing out the inside with a paper towl is necessary first . Any spots of moisture or debri will get uneveness / dimples . for Some reason . Pretty Basic . The Water ones being thinner are good for practise , and cutting to fit . You can scrap a few . means you good coke bottle one can be scribbed with a scalple and ruler on the plug . Then cut the bottom / slice - Clean to free . Then the surgical / toe nail scissors used on the pre scribbed cut lines . Id just dope tissue strips on the canopy , for the frame . 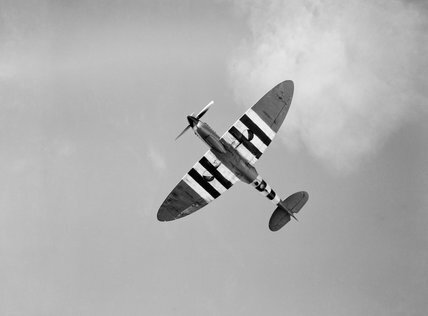 Nearly all aircraft had nearly or flush frames . Some pre colour ( the scale boys ) the frame stuff before affixing . Almost quicker to do than rtead . I took a couple of photos showing how tight you can get silk when applied dry. Barely get a piece of paper under the straight edge. This is my GBR-3. Visit the Build over at CFC Graphic's vendor's corner. Here's what a finished GBR-3 looks like.